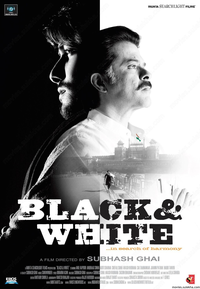 Review Summary: Black and White is a thought-provoking film that challenges the state's stereotypical formula to combat terrorism. BLACK & WHITE is a fine effort from a master storyteller who dares to change lanes with this film. When showman Subhash Ghai makes a directorial comeback after five years with a film thrashing fundamentalism with a sober-sounding name like Black and White, you wonder its outcome. Black and White is a thought-provoking film that challenges the state's stereotypical formula to combat terrorism. It is the sentiment that plays hero. Not bad, but overall Black & White works forgettably, like the just-mentioned Jagjit Singh song: it makes you seek succour in Karz or Taal [Images]. Subhash Ghai is synonymous with larger than life movies. Movies that cater to the popular tastes. With Black&White, Ghai changes lanes. Deviating from the large canvas, extravagant sets and soulful-music-with-lavish-settings, he comes up with a film that"
Black & White has an inconsistent limp and ultimately dumped-down script that ultimately swallows the few sparkling moments it contains.